Flexible fiberscopes are great for one-handed operations so that your other hand can do the work. They come in sizes ranging from 0.5mm to 10mm and feature 2-way articulation. They are usually rugged with a stainless steel insertion probe and water and oil resistant. They work great for automotive, aircraft, marine, locksmith, plumbing, and machine or casting inspections. This flexible fiber scopes offer high resolution optics, with stainless steel braided insertion probes, which are tough and flexible. The 90 degree two-way tip articulation allows inspections in tight areas. The probes are protected by a stainless steel braided sheath which are water, oil, and gasoline resistant. Ideal for insertion into multiple-bend pipes such as aviation engine guide tubes. The fiberscope insertion tube flexibility changes continuously. The universal focusing eyepiece easily connects to c-mount video cameras through a simple coupler, with a variable focus. The fiberscope light guide is approximately 1 meter long (can be customized for longer length) to allow ample room to work with from the light source. The standard receiver on the light guide is ACMI and there are various adapters available to support your specific light source. 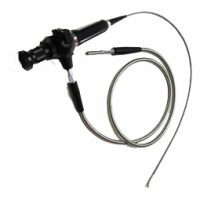 The fiberscope light guide can be used with halogen, metal halide or LED light sources. Please contact us if you have a specific UV application. The fiberscope is packaged in a custom fitted standard duty storage case. The purpose of the fiberscope case is to protect the unit while not in use form damage, heat, cold temperatures and sunlight. Optional fiberscope heavy duty storage cases and fiberscope shipping cases are available. Ask about our fiberscope repair exchange program to help eliminate your fiberscope inspection downtime.